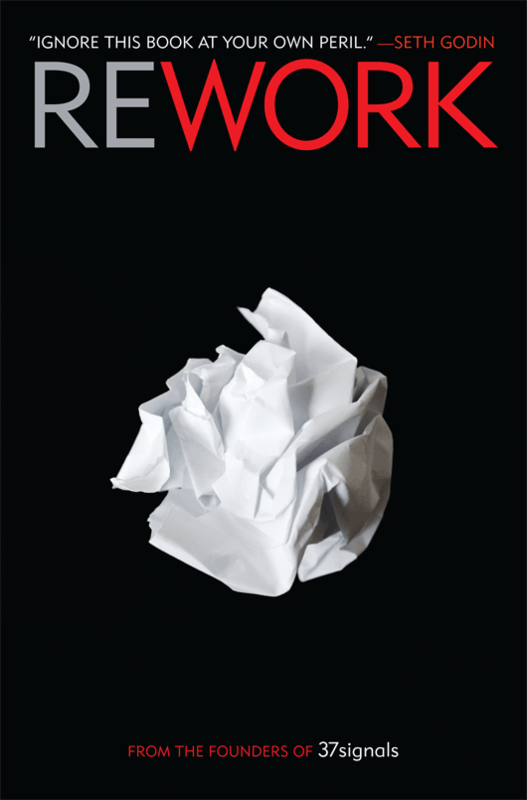 Jason Fried and David Heinemeier Hansson’s new book REWORK is one of the best startup business books I’ve read since Alan Weiss’ Million Dollar Consulting. If you’re already a fan of their signal vs noise blog, you’d be familiar with their terse style. Sharp and to the point. Which is why you can pick it up and read it in a few hours. You’ll want to because it’s well written and pared down to essentials. In fact the book reads like their workflow advice, less mass, do it yourself, cut out the fat, concentrate on essentials. As such they are clearly practicing what they preach, which I like. This book isn’t really for large businesses and corporate success. It’s for startups, and freelancers, and small teams. It focuses on how and why you should do something yourself before outsourcing it so you can learn what to look for. The menus in failing restaurants offer too many dishes. When you impose a deadline you gain clarity. Reality never sticks to best-case scenarios. Share information that’s valuable and you’ll slowly build a loyal audience. Trade the dream of overnight success for slow, measured growth. Getting back to people quickly is the most important thing you can do in customer service. Optimize for now and worry about the future later. You don’t need more hours you need better hours. In fact I started out with a list of my favorite twenty quotes from the book and cut it down to these ten. Go get this book, you’ll be glad you read it.